"I always practice the philosophy that if you find something you love to do, you never work a day in your life," says Rodriguez, CEO of the JAE Restaurant Group in Boca Raton. "What drives me is that every day is a new day, especially in fast food, and especially when you're dealing with people," he says. "The best thing I learned from Dave Thomas is, 'Take care of your business and your business will take care of you.'" Rodriguez also believes in creating a culture that flows throughout the entire organization and its more than 5,400 employees. "The DNA you create has to be one that can be sustained even when you're not there. It creates commitment, rather than compliance," he says. "Dave was a very simple man with five values: 1) Quality is our recipe; 2) Treat people with respect; 3) Give something back; 4) Profit isn't a dirty word; and 5) Do the right thing. And we still live by them. It's a team effort with a lot of moving parts, and it takes a lot of commitment." JAE, which opened its first Wendy's in 1993, has grown through merging with and acquiring Wendy's restaurants from other operators and from corporate. In September JAE announced it had added 97 restaurants in South Florida through Wendy's refranchising program. "I thought about where I wanted my family to be," says Rodriguez. "My son, who is a part of the business, embraced the idea of growing and was ready to take it to the next level." Part of his growth strategy was to create an "A-Team" of top talent experienced in mergers and acquisitions. "We acquired poor operators and bought them at the right price, which put us in a position where lenders could help when the company decided to sell markets, and we got to pay less for broken stores to fix them with Dave's DNA and culture," he says. "I couldn't have done it without investing in a great CFO, COO, and president. I built a team that had a lot of corporate memory," he says. JAE President Ed Austin had spent 39 years at Wendy's, leaving as SVP when he joined JAE in 2015. COO Ben Mansoor had been a regional vice president for Wendy's for Latin America and the Caribbean. Jim Christopherson, who served as CFO for 2 years until this past October, had worked with Rodriguez previously at Burger King (where Rodriguez began his career in fast food) and became well-versed in restaurant acquisitions during his 20 years at The Cypress Group. Rodriguez says he relies on his franchisor to strengthen the brand responsibly. Part of that strategy includes closing or selling unsuccessful units to top operators to improve and protect the brand. "The franchisor makes money from the top line and the franchisee makes money from the bottom line. Both need to be successful for the economic model to work," he says. "That's why you can't overbuild." Successful brands also need to have a good procurement program, he says. A fatal mistake some franchisor make is getting caught up in confidentiality and creating decisions in a tunnel. "I see franchisee owners as little CEOs, and they need the opportunity to give feedback because they're on the firing lines with the customer every day," he says. "Together, companies can make better and stronger decisions." Rodriguez says his greatest challenge today is adapting to changes in society and appealing to the next generation. "This is the biggest dynamic cultural change I've ever seen. I'm a Baby Boomer, but the next generation thinks differently. They want to be part of something big, and they want to give to organizations like the Dave Thomas Foundation for Adoption. They are all about being more inclusive and helping their communities," he says. "Gen X is different. They believe in constant growth. So we've added self-serve kiosks and wi-fi bars to appeal to the customers of tomorrow. Any company that doesn't adapt to the younger generation won't have dominance in their market. If you're green, you're growing. If you're brown, you're dead." In the next 10 years, Rodriguez will be considering his exit strategy. He would love to see his family carry on the business, but even if they don't he knows he has options. "If you're a great franchisee with a great company, there's always demand for your business. You can sell to another franchisee or you can sell to the company," he says. "How many people can go into a business knowing you'll come out stronger than when you started?" Rodriguez believes JAE's growth is proof that Dave Thomas really did have the best advice: to take care of your business and it will take care of you. And it has. JAE (named for Co-Chairs Jhonny Mercado and Andres Garcia, and CEO Eddie Rodriguez) has been recognized for its achievements with the Wendy's Award for Best Operator in 2002, the Dave Thomas Award for Best Overall Franchisee in 2003 and 2012, and Rodriguez was recently inducted into the Wendy's Hall of Fame. Assistant manager trainee for Burger King. Attending public speaking classes, hearing presidents give speeches, and attending The Wharton School. 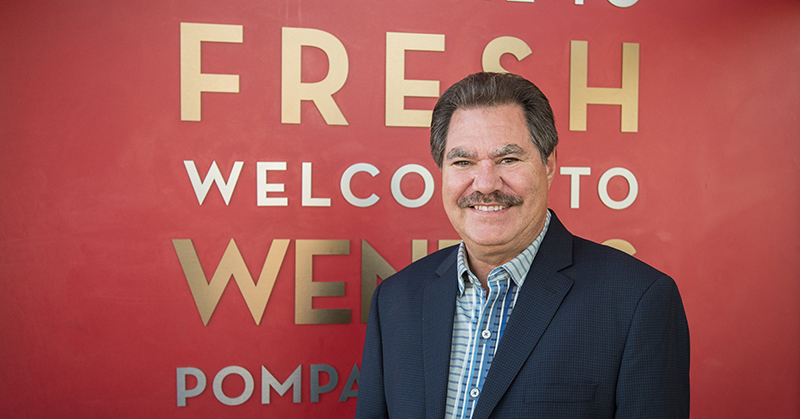 Sharing success with family and friends, building one of the biggest Wendy's franchisee systems, and becoming one of the 10 biggest Wendy's franchisees. Creating stability in the company so team members can achieve long-term success. Transition the business to the next generation. When I left Burger King in 1988. Since then, I tell everyone I couldn't pay for the education I received there. It put me where I am today. To expand the Wendy's brand in 2013. Since then I went from 13 units to 179. That you can't dictate the needs of team members or customers. I try to do 45 minutes on the treadmill every day, and play racquetball. From my father: Whatever you do, be the best at it. People development, being able to give back and pave the road for team members to be successful and grow into management. It's very hard. I try to stay positive and laugh as much as I can. Eating a cannoli every night. I give back a lot in a quiet way without acknowledgement. I sit on the board of directors for the Boys & Girls Clubs of Broward County, an organization near and dear to my heart. When people disrespect others. No matter your opinion, you should respect the feelings of everyone. To provide more for my family than my parents could provide for me. To create a strong DNA and culture that resonates with internal, external, and outside partners' expectations. Everyone is born with a brain free of charge. Let them use it. Adapting to changes in today's society and understanding employees and customers and their needs. Passionate, determined, sincere, and influential. Continue to become a better leader and a better listener. I give them a long rope, only pulling it back before they drown, if necessary. Extremely close. Whenever I judge progress, all I do is go to restaurants and talk to managers and employees. Strengthening of the brand, transparency, and improving the economic model. Yes, we've had to create value and update restaurants to cater to Millennials and new generations. We've had to transition traditional ways of marketing to staying up-to-date on social media, which is growing faster than TV and radio. We have a hire-for-life mindset and fire only if they are jeopardizing the brand or the company. By creating a very strong culture that fosters growth. These go hand in hand. We commit to training to develop team members' skills. A lot of coaching and outside development such as classes and sometimes counseling. To be insensitive to others. To grow the company organically with 10 new restaurants per year. In 5 years, I want to be retired and on executive boards to help build better companies. In 10 years, I want to be traveling, watching the next generation grow the business, and making sure the DNA of the company stays true to its values. How is the economy in your region(s) affecting you, your employees, and your customers? Competitive, but most of our market is a gateway to Latin America, so it's healthy and robust with lots of opportunities. Absolutely. Miami and Fort Lauderdale have so much to offer in terms of growth from Latin America. We do more research on customers and employees in order to be effective and have more flexibility. We monitor the business daily, weekly, and monthly. Although we have a budget, we monitor it daily. What are the best sources for capital expansion? Internal cash flow; 30 to 40 percent of cash flow should be used for capital reinvestment. Absolutely. In today's business environment, you need to have relationships with a number of financial institutions. You also must have a great management team and not just invest for today, but invest for tomorrow. It's not about what you want, it's about where the company is going to go. We host a big holiday party every year in every market. We've increased vacation time (four weeks after 10 years) and we've tried to create an environment that enforces happiness by giving lots of recognition for hard work. We look at this as a cost of doing business. While it does affect the bottom line, we provide our employees with the best healthcare insurance and 401(k) plan, and we pay top dollar for great talent. Although costs are rising, we stay ahead and make sure we are paying better than the competition. We give monthly recognition of the employee of the month at the office, parking spots, holiday parties, and hold GM rallies twice a year where we bring all the GMs together and give rewards based on performance, sales profiles, and people development. I plan on turning the business over to the family by creating value and creating demand for the business. If you have a successful business, you will always have an exit strategy and never have to worry about it.